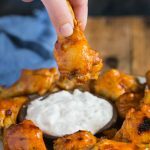 My Pressure Cooker Chicken Wings with Buffalo Style Sauce are perfect for your next party and are served with a delicious blue cheese dip that will wow your friends! Watch the recipe video! It's right below the directions. Mix blue cheese in a bowl with the mayonnaise, sour cream, vinegar, lemon juice, garlic powder, salt and pepper an stir to combine. Cover and chill for 2 hours. Combine all the chicken wings sauce ingredients into a small pan, stir and cook for a few minutes until smooth. Add a steamer basket into your pressure cooker along with 1 cup of water, and add the chicken wings on top of it. Lock the lid, turn the steam release vent to 'sealing' and using the 'manual' or 'pressure cook' button, adjust it to cook the wings for 5 minutes. Remove the chicken wings and place them on a rack over a sheet pan then turn on your broiler. Liberally brush the chicken wings with the sauce and broil for 3-4 minutes and then turn them over add more sauce and repeat as desired. Serve the chicken wings hot with the blue cheese dip on the side.